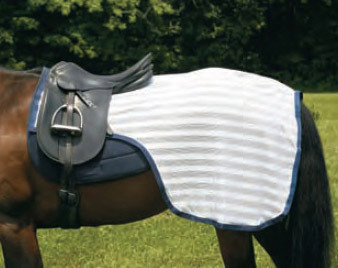 If you ride a horse with sensitive flanks or you've ridden through the reaction to a horsefly bite, you know what a valuable tool a flysheet can be. Flysheets for turnout have been common for years- now you can offer your horse that same protection when riding in areas with mosquitoes, horseflies, and other bugs. 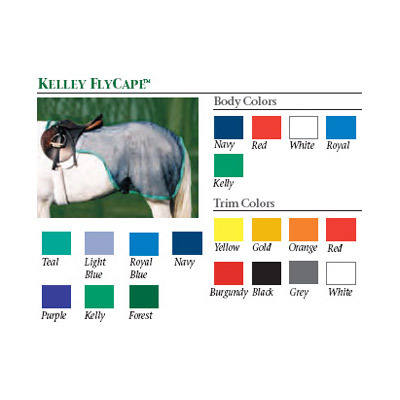 This fly quarter sheet is put on over the saddle pad and under the saddle. 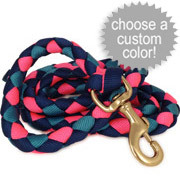 Your saddle and girth secure it in place. 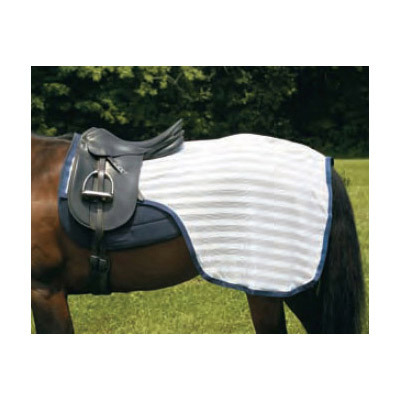 This fly-sheet covers your horse's hindquarters just like a quarter sheet and to prevents irritation from fly bites on flanks during schooling or trail riding. 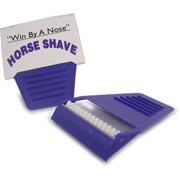 Can be used under all English and Western saddles and even driving harnesses. 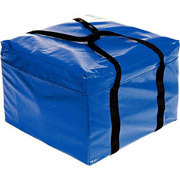 Professionally manufactured in your choice of custom colors in 4-6 days- or choose medium or large and white with black trim for immediate shipment. Review Text: The size runs a bit small. So order accordingly. My 15-3 WB needed a large. The designers need to add a tail guard!!!! Big design flaw. I have retrofitted a blanket leg strap do do the job or the moment but will add grommets and tail guard when season is over so it is ready for next year. I consider it unsafe to hack without some sort of method of anchoring the back end of the sheet. The fabric seems fine for the job. "Must have for bug season"
Review Text: I purchased this for my 16.2 Foxtrotter. Georgia bug/fly season is the worst. Not only does it fit great and NOT blow around, but the pests are leaving my guy alone. And it will work for my shorter Foxtrotter who is 14.3. Thanks for a great product. I only wish I had found your site sooner.